(LHU SPORTS) LHU’s Kyle Shoop celebrates after winning an NCAA wrestling match. Shoop and the rest of the Bald Eagles face Appalachian State today in its regular-season finale. LOCK HAVEN- The No. 21 Lock Haven University wrestling squad caps off its regular-season Saturday night against Appalachian State (App State). Lock Haven (9-3), won the Eastern Wrestling League (EWL) regular season title outright with a 6-0 sweep of the league. LHU now faces an App State team that is 8-6 in duals, and has won at least a share of the Southern Conference (SoCon) for the fourth consecutive season. The dual should be competitive at most weight classes, as the two teams boast a combined 10 nationally-ranked wrestlers per the latest NCAA Coaches’ Panel. This system is used to help determine NCAA Championship bids per conference. 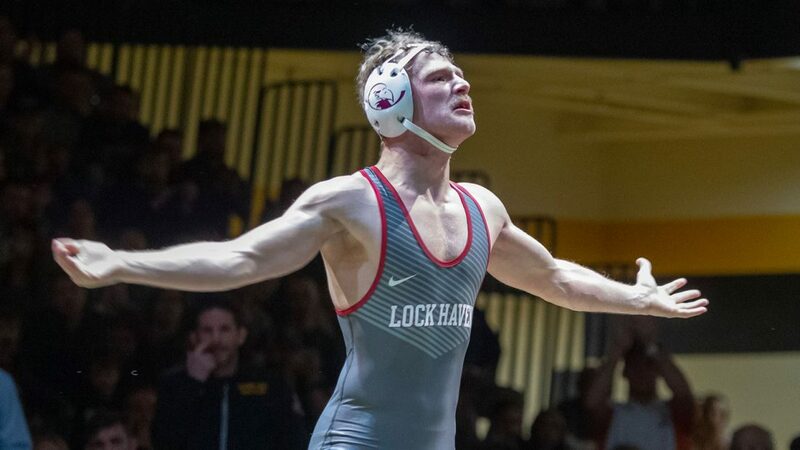 Lock Haven gets the opportunity to meet several of its preseason goals by winning the dual. The Bald Eagles would hit the 10-match win threshold for the second straight year with a victory. Additionally, the team has the chance to finish the year with a perfect record inside the Thomas Fieldhouse. To date Lock Haven is 4-0 in its home gym, with this serving as its toughest home matchup to date. Two weight classes are expected to consist of nationally ranked wrestlers. The 133 pound matchup should feature Lock Haven redshirt-junior DJ Fehlman (No. 30) and App State sophomore Code Russell (No. 29). Since dropping down from 141 pounds in late January, Fehlman is 6-1. The other ranked bout is at the heavyweight slot. LHU redshirt-senior Thomas Haines (No. 22) meets App State junior Cary Miller (No. 26). Haines is in the midst of a seven-match win streak, as he takes the mat inside the Thomas Fieldhouse for the final time in his career. App State comes into Saturday night’s dual off as short a turnaround as you can have in multiple duals. The Mountaineers will wrestle at Bloomsburg Saturday at 1 p.m., before hopping on I-80 West for an hour to get to Lock Haven for a 7:30 match. App State owed Bloomsburg a trip after the Huskies wrestled the Mountaineers in North Carolina last year. Since his team had to make the trip to Central Pennsylvania anyways, App State Head Coach JohnMark Bentley organized a home-and-home with LHU. Lock Haven will head to App State’s gym next year for a dual. For Senior Night, Lock Haven will honor Haines, reigning All-American Chance Marsteller, and Derek Dragon prior to the match. Marsteller, who is currently No. 5 at 165 pounds, will wrestle for the first time in two weeks after missing last week’s dual at Cleveland State. As Lock Haven concludes its regular season, Saturday night provides the Bald Eagles with a chance to reach several benchmarks, while preparing for the postseason by taking on a worthy counterpart. The third of three events to take place inside the Thomas Fieldhouse on Saturday (LHU Women’s Basketball plays at 1, followed by the men’s game at 3) should be a terrific way to finish the day.